И снова быстрая выплата бонуса! Спасибо! Благодарю за рефбек в сумме 1.20$. The amount of 30 USD has been withdrawn from your account. Accounts: U20931568->U20886427. Memo: Shopping Cart Payment. Deposit to Limit Energy LTD User Logika28.. Date: 17:16 15.04.19. Batch: 255956509. Sent Payment: 30.00 USD to account U20886427 from U1***73. Batch: 255960619. Memo: Shopping Cart Payment. Deposit to Limit Energy LTD User KirKa22. 15.04.19 17:52	Transfer	Sent Payment: 10.00 USD to account U20886427 from U4951***. Batch: 255962059. Memo: Shopping Cart Payment. Deposit to Limit Energy LTD User grafiti. 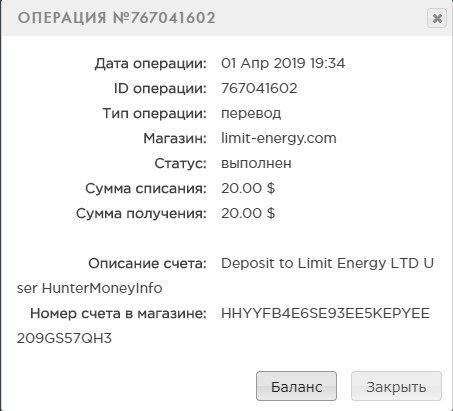 18:49 15.04.19	Receive	255969293 Received Payment 2.58 USD from account U20886427. Memo: API Payment. Withdraw to lavrimix from Limit Energy LTD.